Film is a force of great importance in my life, but I think the word “importance” does film a disservice. The ways in which a film can be valuable are, and should be, as diverse as the medium itself and Importance tends to miss all but one of those ways. It is important to educate ourselves about the people and historical events of the world we live in, but I see no less importance in being able to laugh at our world and our own natures. Nor is it any less important to think about what scares us and surrender ourselves to the act of being frightened by a piece of fiction. Importance is a haughty headmaster who asks us to settle down and talk seriously for a moment. It has trouble even recognizing the lofty matters it claims to hold dear when they are dressed up in the clothes of satire, surrealism, or science fiction. It ignores not just the pleasure, but the intellectual value that laughter or fear or even giddy excitement can have. Importance does not understand why an expression of pure joy could ever trump a frank, educational discussion about a great historical person or period. In 1984, when awards bodies were having sincere, hushed conversations about the Cambodian genocide (The Killing Fields), it did not occur to Importance that a high-concept comedy about grown men capturing ghosts would be the work with a more lasting cultural footprint. In 1993, Importance recognized Schindler’s List, the rare Important Film to be made with some verve and passion, but utterly failed to find the social and spiritual insight in the tale of an arrogant weatherman getting stuck in a time vortex. When The Big Lebowski arrived in 1997, Importance clicked its tongue and said, “You’ll have years to watch your silly stoner detective curio. Now is the time to reflect on the tragedy that befell those poor souls on the Titanic.” I have a fractious relationship with the important films that dominate discussion when it comes time to decide what that film year “meant”. In 2014, well-meaning, watery gruel like The Imitation Game and The Theory of Everything gave the earnest chin-stroker in us all our annual history lecture, while the more interesting and incisive messages were buried inside tales of toy blocks, predatory aliens, hipster vampires, and old Japanese nursery stories. In the end, the world is certainly better for having a medium that can give people prestigious introductions to serious events and influential figures they might not otherwise know about. I would not wish the Important Film away, but I will continue to demand that it use its imagination. If the Important Film is here to stay, then my only request is that it carry itself with a measure of vivacity. For that reason, I am always grateful for the rare high-minded historical film that can break through stilted sincerity to find its own beating heart. This is what makes Ava DuVernay’s Selma the very good film that it is. Selma is primarily the story of civil rights pioneer Martin Luther King, Jr., but it makes the important decision to not focus myopically on the man. This instantly separates it from the majority of films about great men and women. Like Steven Spielberg’s Lincoln, Selma is interested in a small and specific window of time within the larger moment, the Civil Rights Movement, and it locates an abundance of detail there. That moment is 1964, between the passing of the Civil Rights Act of 1964 and the Voting Rights Act President Lyndon Johnson would sign in 1965. The film cares very much for its large ensemble, but it is even more interested in the small details of process and politics. If it is not as bracingly intricate in that regard as great films like Zodiac, Zero Dark Thirty, or even Lincoln, DuVernay still does more than enough to paint a rich, thorough portrait of the times. When we first see Martin Luther King, Jr. the Civil Rights Act of 1964 has already been enacted into law, nominally promising African Americans the right to vote. The legislation lacks the teeth to make good on its promise though, for a number of reasons. Local registrars, particularly those in the South, are still free to bar black citizens from registering to vote, through arbitrary questioning, unfairly high poll taxes, and asking that they produce vouchers from registered voters before their voices can be heard. They also face the threat of disgusting acts of physical violence and humiliation any time they set foot in the court houses. Like Harvey Milk, King recognized and utilized the value of spectacle as a means of effecting political change. With Johnson balking at the idea of passing controversial legislation to protect black voters, King knows the success of this political aim depends on waging a public battle that will capture the national spotlight, thereby forcing Johnson’s hand. Selma is smart and direct about how rhetorical wars are waged and it shows that the first step is choosing your venue. King and his supporters head to the town of Selma, Alabama, to peacefully protest. Because King’s enemy is the status quo, he shrewdly deduces that any victory for change rests on the powerful making mistakes that will rock their own boat. It is an astute theory. To put it into practice, King and his supporters must put themselves in the way of the South’s whips, chains, and billy clubs. King is banking on the town’s bigoted sheriff, Jim Clark, to abuse his authority and put the voting rights movement on the front pages. The activists must calmly welcome aggression against their very persons and they must never retaliate or defend themselves. DuVernay does an excellent job of making police and citizen violence feel sudden, visceral, and brutal. An early scene, depicting the infamous church bombing that murdered four young African American girls, is swift and gutting. As the four children walk down the stairs to the church basement, they talk in adoring tones about King’s wife, Coretta. They see her as a role model, the way today’s young women might look up to Michelle Obama or Hillary Clinton. They are thinking about who they will become. Then they are gone. The racism King fights is indiscriminate about the lives it ruins and when it chooses to strike. Eventually, neither Sheriff Clark’s brutality, nor the murder of a young activist by National Guardsmen brought in by Governor George Wallace are enough to persuade Johnson to pass the Voting Rights Act, so King must stage an even larger battle. King decides to march protestors the 50 miles from Selma to the Alabama State Capitol in Montgomery. King hopes that the very real possibility of violence and death along the way will force Johnson to relent. Through the prism of this one effort, Selma examines the numerous modes of voter oppression, generously observes the way large political movements impact and complicate the lives of their leaders, and views a web of political schisms on both sides of the voting rights conflict. Selma is also a great work of ensemble acting and an invaluable showcase for a host of great, underused black actors, from Carmen Ejogo to The Wire’s Wendell Pierce to Keith Stanfield (nicely following up his nuanced work in last year’s Short Term 12). Henry G. Sanders gives a delicate, heartbreaking performance as a blind man whose grandson dearly wants him to vote before he dies. That said, the highest honor belongs to David Oyelowo, whose performance as King is beautiful, rousing and wrought with a simmering intensity that the film itself could use just a bit more of. The less impressive acting comes from the white cast members. Tom Wilkinson is a great actor and he does a reasonably good job of presenting President Johnson as a man both socially progressive and politically selfish, but his sturdy performance is difficult to feel enthusiastic about. More problematic is Tim Roth’s opaque depiction of Governor George Wallace. Roth mostly keeps the character from tipping over into sheer villainous caricature but he never presents any real sense of the man’s inner logic or demons. Even when DuVernay has Johnson privately ask Wallace why he would jeopardize his career over the issue of black voter registration, Wallace cannot provide a truly honest answer to the question. Perhaps there is not much to be gained from staring into the soul of a man like George Wallace, but the decision to look away nevertheless causes the film to briefly scrape against the shallows of formula whenever he is on screen. On a broader level, the film as a whole occasionally falls into a kind of inertness that is characteristic of the biography film. Some of the editing choices feel a bit predictable, such as a cross-cutting between King’s activists, a rival activist group, and a group of racist policemen on the eve of the Selma marches. Selma is never anything less than a good film, but it has moments where it may tell its story too economically to become truly transcendent. It is by no means a simple-minded film, but it is a film of relative simplicity, for better and just occasionally for worse. This mostly has to do with the script, which DuVernay rewrote herself from Paul Webb’s initial version. For the most part, she does a very good job, especially considering that she did not have permission to use King’s actual speeches. As a result, DuVernay wrote new speeches for King, and they are undoubtedly the most well-written moments of the film. Like Tony Kushner’s script for Lincoln, DuVernay’s script is rigorous and clear-eyed about the nuts and bolts of pushing the needle of social progress forward. However, DuVernay does not quite have Kushner’s ear for tight, scintillating language. It would be too harsh by half to call Selma prosaic, but it often wants for true poetry. Nevertheless, Selma is a perfect example of what the Important Film can be at its very best. It is straightforward without being rote, sincere without being didactic, and moving without being saccharine. There is not a single thing heady about it, but it is absolutely as smart and alive as it needs to be. It gracefully explores an important moment for human rights and points subtly to racial issues that still plague our society. Ultimately, I do not feel I have the right to criticize Selma too harshly for what feel like minor shortcomings. Its goal is to raise awareness of a sad, arduous, and eventually triumphant moment in American history, not to give a temperamental white cineaste another thorny auteur piece to masticate over. 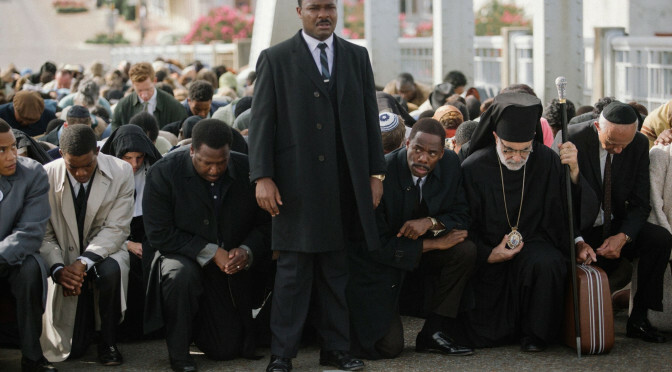 Besides, by being something less than a bold, cerebral masterpiece, Selma puts itself in position to achieve what surely must be its real goal. It has the power to educate on a grand scale, from concerned young adults to the older citizens who were there to experience this injustice firsthand. And, above all, it can educate children who will one day decide the direction of this country and this world. This is a film that unblinkingly depicts the horrific oppression African Americans faced during that time, and yet can still be shown in any classroom in this country. That makes Selma a film of genuine importance, not just one masquerading in Importance’s finery. It feels strange to praise a film’s broad accessibility, particularly when I think it would be a more vital film without it, but I also believe Selma knows exactly what it’s doing in being less cinematically dynamic than it could be. President Woodrow Wilson famously spoke of the very racist, but highly influential film, Birth of A Nation, as feeling like history written with lightning. By this, he meant that events of the past were rendered with a galvanizing immediacy and an exhilarating cinematic electricity that made them breathe on the screen. Selma is too gentle and earnest a film for me to call it dazzling, either as a sensory experience or as a piece of screenwriting. But it is an exceptional history lesson, and one whose relevance to the present cannot be overstated. DuVernay is a humane and confident filmmaking talent, and I have no doubt that she will soon direct with her own special kind of lightning. For now, it is enough that she has taught herself to write history with soft sunlight and the low rumble of distant thunder.